I remember when my parents put a set on the head. I was thinkin' what's this sissy stuff? I just received a "Stoneberry" catalog (un-solicited lol) in the mail and they have a 5 piece set (choice of seven colors) for sale for $19.99 Includes seat cover, tank & tank lid cover, contour rug and bath rug. Your guess is good as mine, Tameka. Garage sales? eBay? We don't have anything for sale here. The worst thing about them is when you're at someone elses house...You're standing there doing your "business" and the lid falls, because all that thickness wouldn't let the lid stay up. This is an item that a single man would never buy. A fuzzy furry toilet isn't a priority with a guy. If you live in a place that rains, snows, floods, from September to June. average 130 inches a year, and the house is so tight that fans must run at all times, anything that traps moisture...any gaps where water gets in, not just a health threat, but let it go at all and it's either work day after day and hire techs...don't let it start...Rain out, wildlife out, vermin out, indoor cats in, humans in...Game for my kids: "What will happen next?" We had one set of these, until my mother realized that the seat cover spent as much time on the bathroom floor as it did on the seat. Well where is the actual seat cover? Those were cross - imagine the bacteria in them! 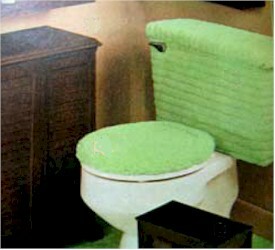 I remember my mother in-law had a burgundy set - seat, tank and toilet roll cover.